Somewhere between Christmas and Easter, I found myself with a second-hand ham taking up half of my freezer. Sometimes a lazy Sunday is reason enough to cook 11 pounds of meat and watch some basketball (always a pleasure seeing Bruce Weber stymied by Bo and the boys). Oh and the Oscars (The Dude wins!). I guess today was a holiday after all. A quick scanning of my modest cookbook library yielded an interest-piquing recipe from my Dean & DeLuca Cookbook for a poached/baked ham with a coffee and brown sugar glaze. The severe lack of coffee and coffee-related food items in my life right now made this one a no-brainer. Coffee and pork – together at last. I ended up making a half recipe so I cut my 11-12 lb ham in half and halved the measurements for all of the glaze fixins. Place ham in a very large pot and fill with water until it covers ham. 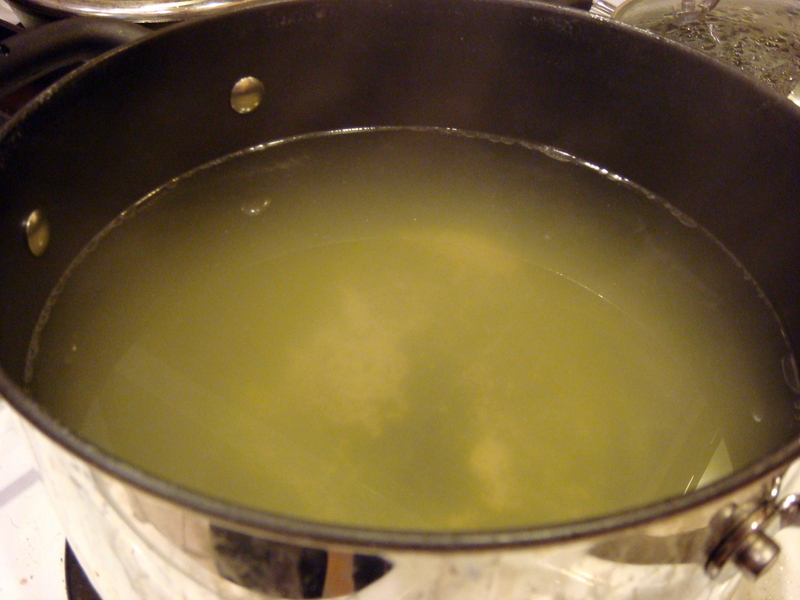 Cook over high heat on top of stove until water begins to boil. Reduce heat to low, and let ham poach for 1 1/2 hours. 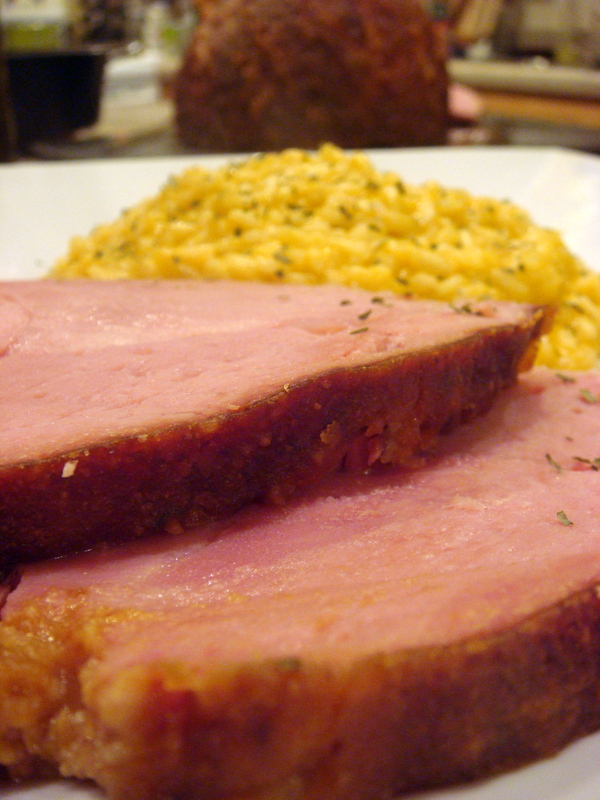 Remove the ham from the pot of water and place in a large baking pan. Carve away the excess fat, and some of the rind. Spread the glaze evenly over the ham. 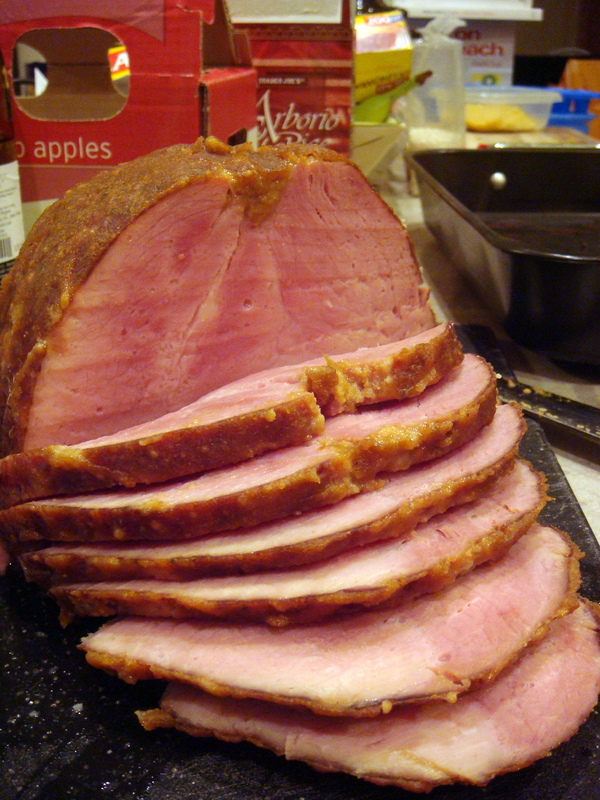 Reduce the oven heat to 375 degrees and bake the ham for 20 to 30 minutes, or until the crust is hot and dark brown. Allow the ham to cool for at least 15 minutes before carving. My housemate was kind enough to put together some Hooks 3-Year Cheddar risotto (which can be made in much the same manner as my Mushroom risotto, only with the red wine swapped for white and a cup or so of grated cheddar instead of, or in addition to, the parmesan at the end) that paired pretty damn well with the ham. The glaze provided a nice hit of sweet/roasty/malty depth of flavor that was a welcome change of pace from your standard pineapple and clove accoutrement. Now how long is it going to take for me to eat 10ish pounds of baked ham? I have some ideas, don’t worry. Hot Ham Water. Better thirst-quencher or BEST thirst-quencher?